I stopped learning new acronyms years ago. I find them annoying – but maybe that’s because I’m in education where acronyms seem as important as curriculum. I just knowingly nod my head when they come up in conversation. You know what? If you wanna talk to me you have to use full words now. I’m acronymed up to my eyeballs. However, and it’s a big but, I found a new acronym that I was willing to learn. Last week was Ontario Craft Beer week and my wife and I attended an event at The Albion. My new favorite acronyms are IPA and RPA. The Mad Tom IPA (India Pale Ale) and the Cameron’s RPA (Rye Pale Ale) were hands down the winners of the event. And while the Albion wasn’t really holding a contest you need to remember that I have a Physed degree and most everything is a contest to me. While I’ve always been a fan of the Wellington SPA (Special Pale Ale) I was blown away by two ales at the event. 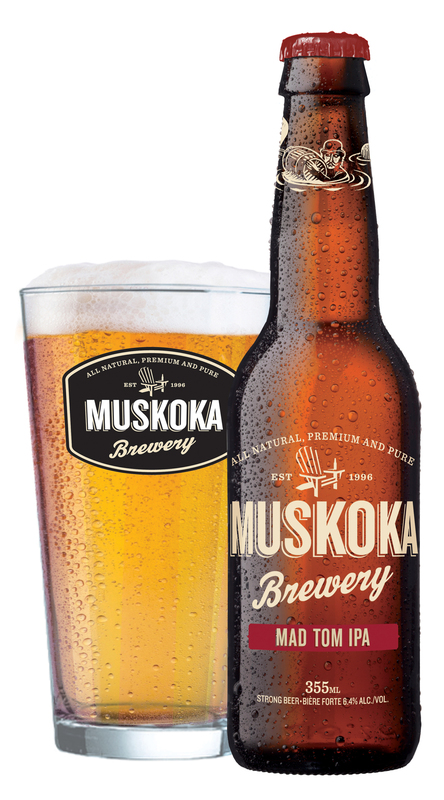 Muskoka Brewery’s Mad Tom IPA is made with two hops and a whole lot of WOW. It tastes like somebody threw a whole bucketful of spices in the brew. A predominant juniper / pine finish makes for an exceptional IPA. The second great ale, Cameron’s Rye Pale Ale (RPA), was the most complex ale I’ve ever had. It is made with 7 different hops and a generous amount to rye. However, there is a major flaw in this RPA. You can only get it at the brewery in Oakville. 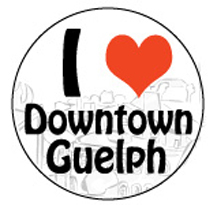 So I’m begging somebody in Guelph to carry the RPA on tap – I’m begging you – throwing down the gauntlet if you will. Baker St? Wooly? Any takers? I have the regional rep’s business card if you need it. If you are going to the LCBO – or “the Happy Store” as my friend DaniBP calls it – and you want to know what the wine blogger (me) is buying these days then I have something for you. 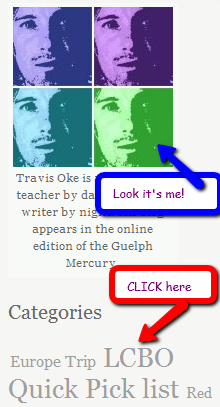 At the right of this blog page – just under the shameless self-promoting image of my face – is a link to the LCBO Quick Pick list category of my blog entries. A click and a scroll down this category will give you some good ideas. But don’t get used to it. My brother-in-Spain doesn’t read this blog for the wine recommendations – in fact he gets mad at me for suggesting wines and not writing foolishness. So this is for you Guitar Glen, Rugby guy, and anyone else who doesn’t have the patience to read through my thoughts on Albert Einstein, J.Crew, gooseberries, and the dreamy David Beckham looking for wine notes. Back to the photo of me – isn’t shameless self-promoting what the word blog means? 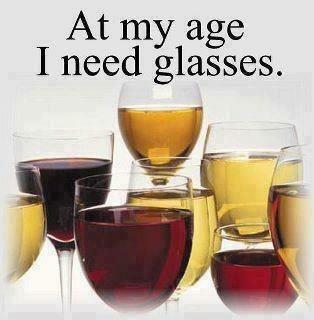 If I could convince you of one new wine rule to follow it would be this – Refrigerate your red wines this summer. Most of the red wines that you consume in the summer are lighter and benefit from cooling them off before you drink them. The fruit comes out – you keep juice in the fridge don’t you – and the tannins usually aren’t so heavy that they get harsh at a lower temperature. Half an hour in the fridge will do the trick. We drank a Minervois (Midi, France) the other night and I hated it. Poured the remainder of my glass down the drain. I “wine savered” it anyway using my Weinfrischhalter Geschenskset and put it in the fridge. Being too lazy to open another bottle the next night I had a glass of the chilled wine. This time I liked it. I liked it a lot. Here are a couple of wines to try “cold”. The bottle is pretty enough to bring as a hostess gift. Georges is a consistent producer of quality Beaujolais. Light bodied and fruity. Maybe a little soft to stand up to grilled food but is perfect with a Niçoise salad. 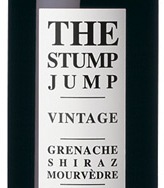 Aussie version of a Côtes du Rhône (English: Slopes or Hills of the Rhône) – a little lighter perhaps and enough tannins to stand up to grilled food even when chilled. The UEFA Championships are underway and I have devised another scientific method for determining the winner. 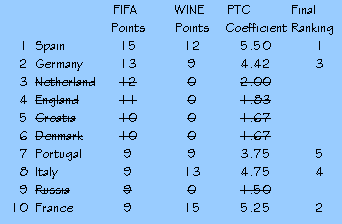 This time I have a statistical analysis based on the FIFA country rankings and my own Wine rankings. I have weighted them and this is what I get. Using these new coefficients (pullthecork coefficients), based on the formula that took me 15 seconds to develop, the tournament will work itself out this way. Spain barely eeks out this over France – I will celebrate with the most expensive Cava I can find. However, this one will do until that happens. Raspberry and strawberry on the nose, delicious, dry cava with a long finish. Finally, a scientific study that puts beer and soccer together. 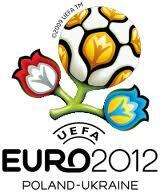 I’ve got the winners for Euro 2012 because the way I figure it the official drink of soccer, or footy as I like to call it, is beer. I know that once I made a case for countries with good wine winning the World Cup but this is a more scientific approach (because this time I did some counting). The way the pools work Germany and England will meet in one semifinal and Ireland would meet the Netherlands in the other semi. Anyone who knows anything about football knows that ain’t gonna happen. But Germany, you look untouchable – and besides that, saying midfielder Bastian Schweinsteiger’s name over and over again will keep me amused for a month. This is illegal in Canada – If you purchase wine in one province, then drive across the border to another province with that bottle you can get 3 months in jail. What is really ridiculous (and I use that word correctly) is that it is going to cost legislative $$ to get this overturned. I don’t have a law degree but can’t somebody just shout “Stupid Law” in the House of Parliament and get it overturned without a vote? Citizens may not publicly remove bandages – I’m all for this one. Gross! A rookie MP from British Columbia’s wine country appears to have convinced the House of Commons to strike down a law that prevents Canadians from buying wine in one province and taking or shipping it to another province for their own consumption.